It seems like Jordan has created a craze that is traveling across the country. Unicorns are the BEST! And apparently, if you were a unicorn, you would taste like the combination of mango and sour blue raspberry. 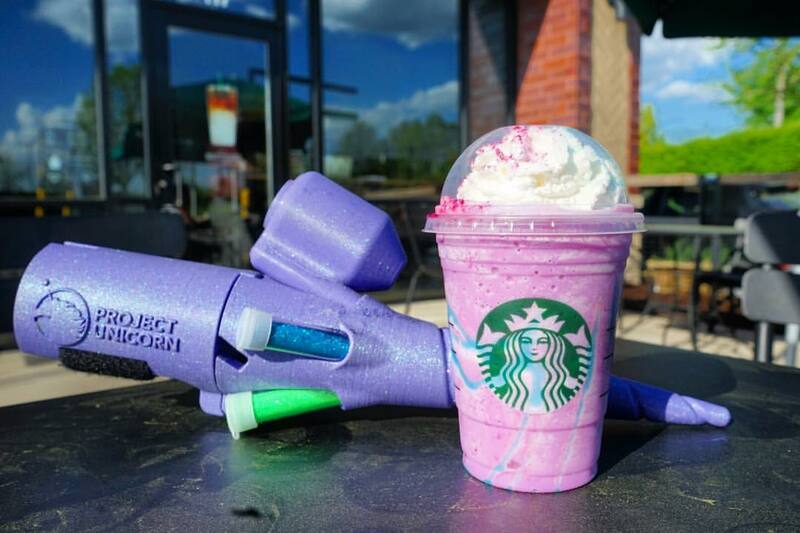 That’s what Starbucks did with its Unicorn Frappuccino. It’s a fun and brightly colored drink that is only for sale for a week. But we couldn’t let that pass without having fun! We would like to unofficially officially claim the Unicorn Frappuccino as the official drink of Project Unicorn. All that 3D designing, 3D printing, and glitter shooting can make you really thirsty for an intensely sugary drink. It also gives you triple the energy to run around and spray your friends and/or enemies! To make things even more fun, Jordan tried her first drink wearing her unicorn onesie and went live on Facebook to share her thoughts. Fun, right? If you can’t have fun with sparkles and unicorns, when can you have fun? Great post, Jen. Unicorns do exist!